If you want to understand the shift in global business, watch out carefully what is happening these days in New York. Alibaba Group is in for an unprecedented bonanza, launching the biggest IPO in history on Nasdaq. Few would have bet money on the Chinese e-commerce giant when Jack Ma, its charismatic founder, entered the global arena at the end of the nineties. 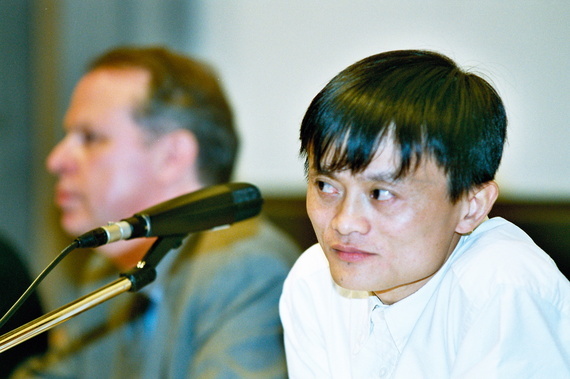 On May 27, 2000, Jack Ma told a global audience at the St. Gallen Symposium in Switzerland that he is worried about the $25 million he had just received through venture capital. "I don't know how to spend so much money, and I still worry about how I can spend as little as possible." It is about spending money wisely and doing things properly, he added, sensing that there was too much money available for internet companies. And he was right when shortly afterwards the first wave of internet business hit the rocks. But even at the time with limited global recognition, Ma was no stranger to the idea of going public. "In 1995 when I started my internet company in China, people thought I was a crook who was lying about a network that never existed. It was tough but today in China everybody is talking about internet, talking about IPO. Even my mother is talking about IPO, POI or something...."
Today, it is Jack Ma's IPO that is on everyone's lips and how he managed to shape the Chinese e-commerce business over the last almost 20 years. And guess who he was on the panel with, back in 2000 at the St. Gallen Symposium? Jorma Ollila, then-chief executive of Nokia, the world's largest mobile phone company at the time. Jack Ma was the slightly peculiar foreigner, Ollila the king of the castle. Today, no one cares much about Nokia; it is the Alibaba tale that is going to break all records.